The title of Alida Cervantes’s exhibition at the Boston Center for the Arts’ Mills Gallery, “Majas, cambujas, y virreinacas,” is challenging to translate. Historically, the words categorize according to race and class. Cervantes made up the last, combining the word for vicereine — the viceroy’s wife — with one for peasant or hick. Her bold paintings address the historical stew of race and class in Mexico. She takes off from colonial-era casta paintings and other art-historical tropes. Casta paintings portrayed interracial families, detailing the family members’ percentages of Spanish, indigenous, or African blood. Mexicans didn’t criminalize interracial marriage, as Americans in some states did, but they were fussy about classification, and their social infrastructure was no less tangled up in power dynamics. 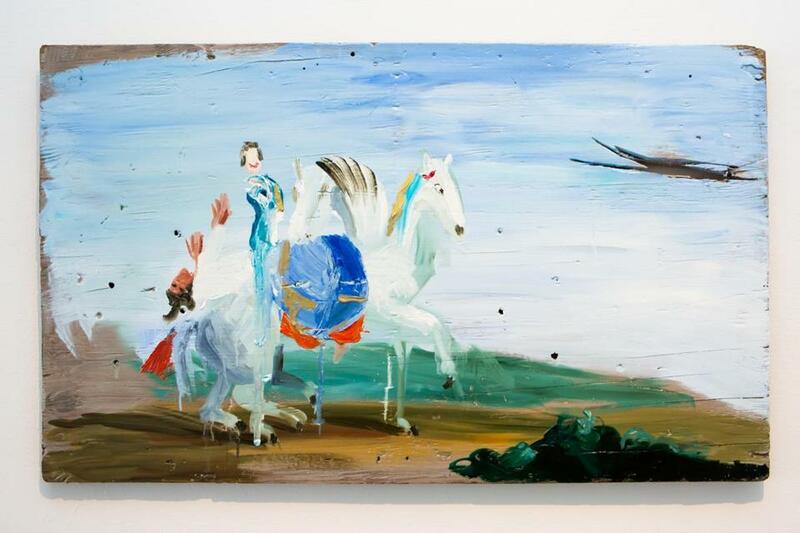 Cervantes, in lush, messy paintings on found wood and corrugated aluminum, exposes those dynamics. The dreamlike works sometimes imply violence or abuse. The low-end materials clash with the high-end art-historical references, again evoking class. 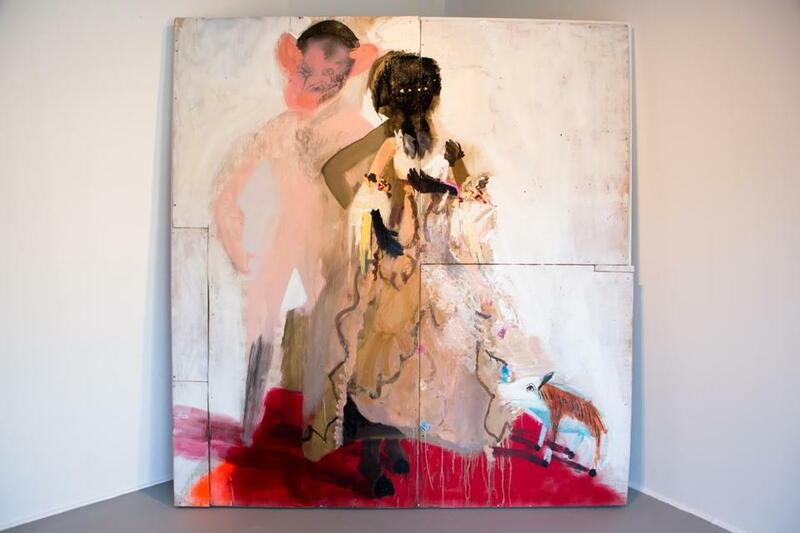 “Dos mujeres, un cochino (two women, one pig)” appears to depict not two women but a black woman in an elaborate dress along with a pink, devilish, naked man. The pig is porcine but tiger-striped — a hybrid. Who rules this household? Hard to say. Nakedness strips the man of emblems of power. His stance is formal, but he seethes, in a goofy kind of way. In “Que hubiera sido de mi, si tu estuvieras aqui (what would have been of me, if you would have been here)” a well-dressed black woman wearing pearls stands slightly behind an ornately bedecked white woman. What’s the black woman’s status? In a gallery talk, Cervantes offered an answer when she said that Baroque-era Mexicans “loved to dress their slaves up.” Another fraught wrinkle in the performance of status. Portraits traditionally celebrate status. Cervantes revisits the form to dismantle social hierarchies. Revealing their trappings, she reaches into lust, avarice, and fear — the true engines of history’s progress. Cate McQuaid can be reached at catemcquaid@gmail.com. Follow her on Twitter @cmcq.